Wyoming’s Supreme Court* will be considering the issue of whether an illegal immigrant who is injured on the job should be entitled to workers comp benefits. In the particular case at hand, one Javier Molina lost a leg after being run over by a piece of construction equipment while at work for Freund Construction. He was denied compensability and turned to the courts for relief. Compensability for immigrant workers is getting to be a hot issue lately. We recently wrote about a move by legislators in South Carolina to bar benefits for injured immigrant workers. Simmons said if undocumented workers would not receive workers’ compensation they would be sought out by employers because it is cheaper to hire them. Retroactive Insurance: Homeowner’s Dream and Actuary’s Nightmare? This is a pretty strange notion: buying insurance after you already know you need it. I can hear my actuary friends saying, “Hey, wait a minute. You can’t do that!” Well, these are special circumstances, so maybe you can. The problem is, someone has to provide the capital, so that communities can rebuild. Louisiana’s insurance commissioner, J Robert Woooley, also thinks that the Mississippi approach is a bad idea. If a law compelled coverage where the contract voids it, there would be a rush of “first one to the door” claims. “If you don’t get there first, you’re going to get nothing…” Because your insurance company might just crumble under the pressure of these unanticipated payouts. Famed litigant Richard Scruggs (we’ve met him before, we’ll see him again) has no sympathy for the insurers. “If an insurance company or two has to go broke, I’m sorry. I’d rather see an insurance company go broke than the tens of thousands of my friends and neighbors in Mississippi, Alabama and Louisiana go bankrupt.” (Perhaps it does not occur to Scruggs that some of his neighbors might work for insurance companies!) The stakes are enormous — not just in this particular instance, but in any foreseeable circumstance where public need is perceived to supercede the language of a contract. The aftermath of the two hurricanes is an unprecedented catastrophe. The scale of the damage raises new and largely unresolved questions of liability. And as in so many of our recent blogs, one of the most compelling questions is relatively simple: “Who pays?” A simple question with no clear response. It’s likely to be years before we know the answer. Special thanks to blogger Martin Grace at riskprof.com, who has been tracking this ongoing saga. Jeffrey and Michael Derderian, former owners of the Station nightclub in Rhode Island, have filed for bankruptcy. The move surprised absolutely no one, least of all the attorneys on the other side. As owners of a club where 100 people died in a rapidly moving fire caused by illegal fireworks, the Derderians are on the hook not only for the lives of their customers, but for the lives of their employees as well. We pointed out in previous blogs going back to 2003 that the brothers failed to carry workers comp insurance for their employees, four of whom died in the fire. The brothers were fined over $1 million by a workers comp court for failing to carry this mandatory insurance. The fine has not been paid and, given the chapter 7 filing, it is unlikely that it ever will be. The brothers have been making some sort of payments to the families of their deceased employees, pending resolution of the case in court. According to at least once source, those payments have fallen short of what is owed. Indeed, substantial as it is, the fine is only about 1% of the estimated $100 million in liabilities facing the brothers. They list their assets at $50,000. That’s pretty slim pickings for the creditors in this unresolved tragedy. The brothers are not the only ones facing the harsh reality of financial liabilities for the fire. Foamex, the manufacturer of the highly flammable (and improperly installed) accoustical tiles that ignited, has also filed for Chapter 11 bankruptcy, although it is not clear from their announcement whether the filing is related directly to the fire or involves other business problems. In the aftermath of any tragedy, especially one involving negligence, there is an immediate and relentless search for deep pockets. The Derderian brothers have basically announced that theirs are empty. Foamex may also be building a firewall (no pun intended) through its bankruptcy filing. There are other layers: the owners of the building; the town of Warwick which inspected (but did not close) the facility; Great White, the band that set off the fireworks (without a permit). And yes, even Budweiser, the company sponsoring the band’s tour. What did they know — or should have known — about the illegal pyrotechnics that made a Great White appearance something special (and potentially lethal). Sure, it’s a stretch to hold the brewer responsible for what happened, but they at least have liability insurance with the order of magnitude to cover the losses. This may be one of those cases where the brewer has a miniscule portion of the liability, but will bear most of the costs. At this point, only one thing is certain. Someone is going to pay. Posted in Business | Comments Off on Station Nightclub: Who Pays? Are TRIA renewal prospects getting a boost? The Hill is reporting that insurance lobbyists have been working overtime since Katrina to extend passage of the Terrorism Risk & Insurance Act (TRIA), the federal backstop for insurers that is scheduled to expire on December 31. Many lawmakers think that the voluntary market should be developing alternatives to cover any terrorism risk, but the hard hit that the reinsurance industry is taking post-Katrina may reinvigorate the debate. Renewal is thought to be a particularly significant issue for workers compensation since it is mandatory business insurance. See Doug Simpson’s May blog on why TRIA renewal is thought to be vital to the workers comp market. Business Insurance is sponsoring a free hour-long panel – A World Without TRIA: Why A Terrorism Insurance Backstop is Vital – a discussion about what this might mean for your business and for the insurance industry. 1:30 p.m. EDT Oct. 12. You can register here. The panelists for this event are: Ramani Ayer, chairman and chief executive officer of The Hartford Financial Services Group Inc.; Bradley Wood, senior vp-risk management of Marriott International Inc.; and Joel Wood, senior-vp of government affairs for the Council of Insurance Agents & Brokers. The discussion will be moderated by Business Insurance Senior Editor Mark A. Hofmann. While the Insider tends to focus on trends relating to workers comp, our esteemed colleague Joe Paduda tracks health care at his Managed Care Matters blog. You don’t have to follow health care for very long before it converges on comp. We’ve been here before and we will be here again. Health care in this country is already rationed, although you rarely hear that term used. (Here’s one doctor not afraid to use it.) Our rationing tool is, quite bluntly, based upon class. Those who can afford health insurance buy it. Those who cannot, don’t. The dividing line is not employment: most poor people work, but they still don’t have health insurance. They either have employers who don’t offer it as a benefit, they work too few hours to qualify for the benefit, or they simply cannot afford it. Nearly 20% of Americans under 65 lack health insurance. In his September 22 blog, Paduda engages in a hypothetical debate with a libertarian who supports Medical Savings Accounts (MSAs) — a mechanism by which people are incentivized not to spend their health insurance dollars. Paduda directs us to a paper by the invaluable Kaiser Foundation, which dismantles the MSA approach one vital statistic at a time. Here’s the bottom line: most health care expenses are incurred by those who are very ill (gee, that’s a surprise!). In fact, 5% of the population burns up over half of all health care dollars. And the sickest 1% account for 40% of the dollars spent. Medical savings accounts would have a trivial impact on this spending, at best. There are truly ominous trends in health care. Costs continue to go up. In addition to paying higher premiums, insured workers are paying higher deductibles, higher co-pays and more and more for brand name medications. As cost rise, coverage declines. Fewer employers opt to provide health care benefits: in the crucial small employer sector (with between 3 and 199 workers), 68% of employers offered health care back in 2000. In 2004 the percentage dropped to 59%. Beyond that, as costs rise, many people with low incomes are forced to opt out. In a number of fundamentals, health insurance and workers comp diverge. Health insurance is an option; workers comp is mandatory. The employee portion of health care is free to rise at precipitous rates — as has been amply demonstrated. In stark contrast, employees never pay a penny for the health care benefits associated with workers comp. To be sure, they are entitled only to payment for treatments directly related to their workplace injuries and illnesses. Nonethless, the treatments are free, prescriptions are free, and injured workers often can collect indemnity benefits while they are disabled. Does this mean we will see more fraud in workers comp, more instances with employees trying to collect comp for non-work related problems? I don’t think so. But we should all be concerned with the overall health of the workforce. On some level, those of us on the workers comp side depend upon the conventional health system to prevent illness, stabilize any non-work related conditions and ensure that our workers are fundamentally sound. It’s hardly reassuring to think that uninsured workers are slow to report health problems, reluctant to seek treatment and unable to access preventive care. We can and should have a “best practice” approach to safety in the workplace, but no safety program can compensate for workers in declining health. These vulnerable workers stand at the very spot where the health insurance crisis and workers comp converge. It’s the scandal that keeps on giving. The Ohio Bureau of Workers Compensation’s (BWC) dubious investment strategy exacted its latest toll with the recent firing of the chief investment officer. Go figure! Who’d have thunk a little speculation in failed hedge funds and rare coins could cause such a ruckus? Coingate has already claimed the BWC director’s job; it’s also left a trail leading right up to Governor Taft’s door, and perhaps beyond. The next victim? Some think it might be the BWC itself. The ongoing investigations have already pushed any workers comp reform off the agenda this year and, unsurprisingly, some are suggesting it might be time for Ohio workers comp to privatize. Ohio is the largest of five monopolistic states. Monopolistic means the state is currently the sole provider of all workers comp insurance – and with a fund exceeding $14 billion, that’s hardly chump change. We’ll keep you posted. From the archives: More here and here. You may remember the Irish tune about Molly Malone, seller of fresh cockles and mussels. Poor Molly died of a fever, but more recently, on a cold, rainy night in February, at least 21 illegal Chinese immigrants died while attempting a nightime harvesting of cockles at treacherous Morecambe Bay in northwest England. The Bay is known not just for its beauty, but also for its deadly coastline with fast rising tides and quicksands. The harvesters were caught when the waters rose behind them, cutting off access to the shore. To compound the problem, they were working at night and were unfamiliar with the terrain. Now the master of the crew, Lin Liang Ren, 29 years old, has been charged with criminal negligence in the deaths of the workers. Morecambe Bay is holds millions of pounds worth of cockles, a small mollusc popular in southern Europe, especially Spain. High prices have caused a rush to pick them. The price of cockles has soared from 200-300 pounds per ton, to 1,500 pounds in the past few years, after mechanical harvesting was banned in Holland, making England Europe’s only supplier. We don’t often toot our own horn but we’re in a celebratory mood after marking our second anniversary of blogging this past weekend. When we embarked on the blog, we weren’t entirely sure what level of interest we’d find for our news and commentaries, but we were gratified to break the 10,000 visitor mark last month. As part of our anniversary “festivities,” we thought that it might be interesting to take a retrospective look at the posts that garnered the most interest from you, our readers. 2. Independent Contractor or Employee? Hood has been joined in his effort to redefine homeowner’s insurance by the ubiquitous Richard Scruggs, who made his reputation suing the tobacco industry. (By the way, Scruggs is the brother-in-law of former Senate Majority Leader Trent Lott, R-Miss.) Scruggs says he will stand up in court for homeowners by arguing that homes were damaged by wind-driven water, not floods. Let me see if I get this straight: a flood is not a flood when it’s wind-driven. Perhaps the only way for a true “flood” to occur is during an eerie calm. Scruggs is going to file thousands of suits in state courts. He said the effort would be aided by a Mississippi statute known as the “valued policy law.” (Read more about this legal concept here.) In a controversial decision last year, a Florida appeals court held that a similar state law required full restitution when a house was partly destroyed by hurricane winds, even though flooding did most of the damage. “The statute provides in these states that if there’s any damage at all by wind, they must pay the full amount,” Scruggs said. A spokesman for the Property Casualty Insurers Assn. of America said insurers wouldn’t pay for uncovered flood damage and that adjusters were trained to determine when flooding was the main culprit. See you in court, sonny! FEMA officials have acknowledged that 60 percent of the affected property owners in Katrina’s zone of destruction may lack federal flood insurance. To rebuild, they would have to take out low-interest government loans — unless Hood and Scruggs prevail. “Insurance policies are legal contracts, specific policy terms and conditions that both sides agree to,” said Joseph Annotti, spokesman for the Chicago-based Property Casualty Insurers Association of America, which represents most major insurers. “To come in after the fact and arbitrarily rewrite the policy coverage to cover losses that premiums were never collected on and reserves never set aside for, that’s an extraordinary legal precedent to set and a very dangerous one.” As it is, the insurance industry is now projected to be on the hook for $40 billion to $60 billion in claims, apart from the Mississippi lawsuit. One thing is certain. If Mississippi prevails and is able to force insurers to pay for flood damage, we will all see our homeowner’s premiums rise to incorporate the new risk. At the heart of every insurance policy is the esteemed work of the actuaries. They like to know the parameters of the risk ahead of time — and I imagine they will be really annoyed if the rules suddenly change after the fact. Stay tuned. Despite the inordinate human calamity and suffering, this is going to be a very compelling — and at least in some respects entertaining — drama. Steven Trucinski, an employee of International Paper Co. in Ohio, was injured in a chemical explosion on October 15, 1998. He sustained severe trauma to his left lower extremity, as well as burns over large portions of his chest, back, and right upper extremity. His leg was amputated above the knee. Under Ohio law, loss of two body parts automatically entitles an injured worker to permanent total disability benefits. Here’s the admittedly gruesome qualifying definition in the comp statute: The loss or loss of use of both hands or both arms, or both feet or both legs, or both eyes, or of any two thereof, constitutes total and permanent disability, to be compensated according to this section. Virtually every state has a similar listing. The court had to confront the issue of just how many body parts Trucinski lost. Does the loss of a limb above the knee involve a single limb or a leg and a foot? In their opinion upholding the claimant, the court cited a definition of a leg in Webster’s Third International Dictionary: “[A] limb of an animal used esp[ecially] for supporting the body and for walking: as a: the part of the vertebrate limb between the knee and foot.” If the leg is between the knee and the foot, then any loss above the knee involves two body parts, not just one. The gruesome details are compounded by what turns out to be a more positive than expected outcome for the claimant. As it happens, Trucinski recovered from his injuries, was fitted with a prosthetic limb and subsequently found employment (but not at International Paper). Despite his ability to work, he continues to collect permanent total disability benefits. So his former employer appealed to the Ohio Supreme Court, arguing that Trucinski’s ability to earn a living proved he was not “permanently and totally disabled.” The court ruled in Tracinski’s favor, citing the language of the statute and their own unwillingness to intervene in a case by overturning preceeding rulings. What are we to make of this high stakes dispute? On the one hand, employers and insurers, confronted with paying lifetime benefits, argue that employability — not loss of specific body parts – should be the determining factor for benefits. On the other hand, representatives of labor, unable to secure well-deserved “pain and suffering” benefits under workers comp, point to the extreme injuries and demand justice for the employee. The court, planted squarely in the middle, upholds the benefits as outlined in the statute, despite what appears to be a huge contradiction: the man with a “permanent and total disability” is actually able to work. Workers comp in this country is nearly 100 years old. When the statute wound its way through each of the states, it was a radical and long-overdue idea: a no-fault system which protected employers from lawsuits, while it ensured that lost wages, medical bills and scheduled benefits (scarring, loss of limbs, etc) were paid to injured employees. It’s the first and only form of universal disability insurance protecting almost every American worker. As we move into the new century, it’s becoming clearer that the industrial model lying at the heart of workers comp no longer reflects the realities of the new working world. In today’s workforce, people change jobs frequently. There are massive layoffs and restructurings in virtually every industry. Yesterday’s corporate giant might be out of business today. Workers, caught in the middle of all this turmoil, might have to retrain three or four times during their careers. A person with one set of limited skills is simply unprepared for the challenges of today’s workplace. The comp benefit structure, visible in stark outline in today’s case from Ohio, was based upon the old industrial model of employment. Fifty years ago, if a worker lost two body parts, he or she was totally disabled, unable to pursue gainful employment. Modern medicine, combined with high tech applications, create myriad possibilities even for people with severe disabilities. 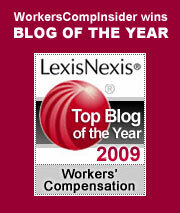 With all the changes taking place in the workplace, it may well be time to re-invent workers comp. Rather than paying people not to work, let’s use our resources to enable people to find gainful employment. Let’s focus on skills development rather than disability. It might open the workforce to people who face artificial barriers. And it might help us focus on the real bottom line: the ability of people to earn a living wage in a job worth doing. That would surely involve a paradigm shift from the current state-by-state morass that is the workers comp system in America.